Aging of the population in all western countries will challenge Emergency Departments (ED) as old patients visit these health services more frequently and present with special needs. The aim of this study is to describe the trend in ED visits by patients aged 85 years and over between 2005 and 2010, and to compare their service use to that of patients aged 65–84 years during this period and to investigate the evolution of these comparisons over time. Data considered were all ED visits to the University of Lausanne Medical Center (CHUV), a tertiary Swiss teaching hospital, between 2005 and 2010 by patients aged 65 years and over (65+ years). ED visit characteristics were described according to age group and year. Incidence rates of ED visits and length of ED stay were calculated. Between 2005 and 2010, ED visits by patients aged 65 years and over increased by 26% overall, and by 46% among those aged 85 years and over (85+ years). Estimated ED visit incidence rate for persons aged 85+ years old was twice as high as for persons aged 65–84 years. Compared to patients aged 65–84 years, those aged 85+ years were more likely to be hospitalized and have a longer ED stay. This latter difference increased over time between 2005 and 2010. Oldest-old patients are increasingly using ED services. These services need to adapt their care delivery processes to meet the needs of a rising number of these complex, multimorbid and vulnerable patients. The increase in emergency department (ED) visits observed in western countries has been attributed to several factors, ranging from the reduced number of ED facilities to demographic expansion. Increase in ED utilization rates has also been proposed as an important factor since the increase in the volume of ED visits outpaces population expansion [1–3]. Among ED users, elderly patients show the highest incidence rates of ED use. As their incidence rate is currently increasing [4, 5], the aging of the population will likely have both quantitative and qualitative consequences on ED activity. Indeed, elderly patients differ from younger patients with respect to their health service needs. They are associated with a higher degree of emergency, stay longer in the ED, are more likely to be admitted to hospital, and are at a higher risk of experiencing adverse outcomes after discharge [6–8]. Several studies have investigated the increased presence of elderly patients in ED [9, 10]. These studies focused primarily on the increase in patients aged over 65 years, without describing the evolution over time of the age-specific burden on ED use among this heterogeneous population. Until recently, the segment of the oldest-old population remained modest (less than 2.3% of the Swiss population in 2009). However, this situation will change in the next 20 years as people aged 85 years and over become the fastest growing segment of the elderly population in most developed countries. For instance, a 72% rise is expected in this population group between 2010 and 2030 in Switzerland. As a consequence, this part of the population will also constitute the fastest growing group of ED users, leading to an aging of the ED patient mix. Providing data on age-specific burden and health service use by the elderly is useful for raising the awareness of health care planners concerning the impact of the impending demographic changes on the potential utilization of health resources. In addition, providing these data is also useful since it makes ED staff aware of the evolving needs of their patients. To further investigate these issues and gain more insight into current trends in ED utilization by the oldest-old segment of the population, we undertook the present study with three aims: 1) to determine the trend of ED use between 2005 to 2010 in a tertiary teaching hospital by very old patients aged 85 years and over; 2) to compare their service use to that of patients aged 65-84 years during this period; 3) to investigate the evolution of these comparisons over time. In Switzerland, health insurance coverage is universal and access to emergency departments is essentially unlimited. The study was approved by the Ethics Committee of Canton de Vaud and constitutes a descriptive, retrospective analysis of all ED visits by patients aged 65 years and over (65+ y) that occurred between 2005 and 2010 at the University of Lausanne Medical Center (CHUV) in Lausanne, a Swiss urban area. The CHUV functions as a first-level community hospital for the 300,000 inhabitants of the Lausanne area, and as a second- and third-level referral hospital for Western Switzerland (about 1 to 1.5 million inhabitants). Patients presenting at the CHUV ED are first triaged by a trained nurse. About a fifth, who suffer from conditions more amenable to primary care, are examined as outpatients and are not forwarded to the ED. These outpatients are not included in this study. The remaining patients (~35,000 patients/year) are admitted to the CHUV ED and were eligible for this study. Data were collected from two administrative databases named AXYA and Gyroflux, which are not freely available. Database access was granted by the management of the CHUV. Overall 98% of ED visits registered in the two databases could be matched through patient and stay identification numbers. Demographic data for the population living in the area of Lausanne between 2005 and 2010 were obtained from the statistical office of the Canton of Vaud. All ED visits by patients aged 65+ y that occurred between January 1, 2005, and December 31, 2010, were included in the study (N = 56,162 ED stays). The incidence rates for ED visits were estimated for the residents of Lausanne, the local catchment area of the CHUV as a first-level hospital. ED visits by patients living in this region accounted for 67% to 70% of all ED visits by patients aged 65+ y during the study period. Variables considered in the analyses were age, gender, marital status, place of residence before ED visit (home, nursing home, transfer from a psychiatric, an acute care or a rehabilitation hospital), date and time of ED arrival and discharge, reason for ED visit, triage level, disposition at discharge (home, nursing home, hospital admission, death), and return to ED within 30 days after ED discharge. The reason for the ED visit and the triage level are assessed on arrival using a local triage scale. Until late 2009, the ED used a local 115-items, previously validated, triage scale (Lausanne triage and priority scale ). This triage scale comprises 5 triage levels (1 to 5), reflecting the acceptable time delay before the patient should be assessed. Starting in 2010, the Swiss Emergency Triage Scale (92-items and 4 triage levels) was used . Because of this change, comparison of this variable over time was performed only between 2005 and 2009. For the purpose of the analyses, patients were classified into two groups: a) care required immediately or within 15 minutes (triage levels 1 or 2) vs. b) care required within more than 15 minutes (triage levels 3 to 5). In this study, the reasons for ED visit recorded from the Lausanne triage and priority scale were aggregated into groups, and only the first three most important categories were depicted. They are analyzed in a separate paper together with the prevalence of the different triage categories among age groups. Length of ED stay in hours (mean and survival analysis) was determined by calculating the difference between the date and time of arrival at, and discharge from, the ED. Patients returning to ED within 30 days after their discharge were identified by their patient ID number. ED readmission rate was calculated per year and an ED readmission was considered as such only when the ED return followed an ED visit in the same year. ED visits were compared for the years 2005 vs. 2010, and for 65-84 years (65-84 y) vs. 85 years and over (85+ y) age groups, respectively. Data used in this study are exhaustive and volumes for ED visits represent the actual number of ED stays. Data were analyzed using descriptive statistics. The chi-squared test was used to compare ED visit characteristics between the two age groups in a given year. Percentage differences by age groups between 2005 and 2010 were tested using the Z-test for difference in proportions. Incidence rates and their 95% confidence intervals (CIs) were calculated according to time and age groups. Relative risks (RR) of incidence rates between age groups and years were also calculated. Differences in mean length of ED stay were compared using the Z-test comparison of means, and differences in median length of ED stay were compared using the Wilcoxon rank sum test. To account for the skewed distribution of the length of ED stay, means were calculated excluding the last percentile of the distribution. Survival curves were plotted to show probability of ED discharge over the first 48 hours of ED stay. Proportions for stays shorter than, or equal to, 48 hours, and excluding in-ED death, amounted to 95% in both 2005 and 2010. In-ED death and stays over 48 hours were censoring events in survival analyses. The log-rank test was used to estimate differences between age groups and between years. The level of statistical significance was set at a P value of < 0.05. Data were analyzed using SAS statistical software v. 4.2. Overall ED activity for patients aged over 18 years increased from 27,473 visits in 2005 to 33,445 visits in 2010, corresponding to an average of 75 and 92 daily visits, respectively (22% increase). Over the study period, patients aged 65+ y represented about 30% of all adult ED visits. Between 2005 and 2010, the mean number of daily ED visits by 65+ y patients rose from 23 to 29 patients, a 26% increase (20% increase among patients aged 18-64 years). Among ED 65+ y patients, the number of visits in those aged 85 years old and over (85+ y) increased from 1,901 to 2,772 visits, representing about a quarter of visits by patients 65+ y (2005: 23%; 2010: 27%). Thus, between 2005 and 2010, ED visits by 85+ y increased by 46%, a trend that accelerated between 2009 and 2010 (Figure 1). 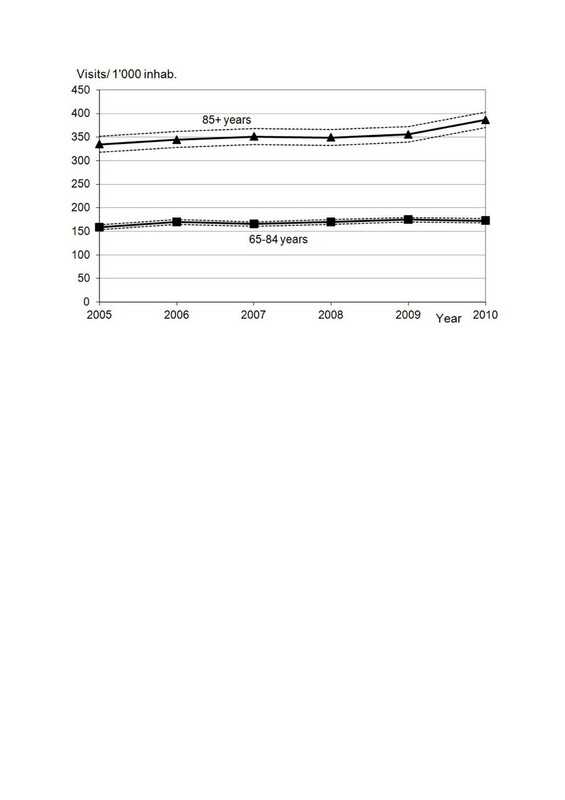 The median age of the 65+ y ED patients increased from 78.7 to 79.3 years. Anecdotally, ED visits by centenarians, mostly women, also increased from 12 to 21 patients between 2005 and 2010. Evolution from 2005 to 2010 of emergency department visits by patients aged 65–84 years vs. 85 years and over. The incidence rate for ED visits increased slightly, but significantly, between 2005 and 2010 in both age groups (65-84 y: relative risk (RR) 1.09, 95% CI: 1.04-1.13, P = 0.040; 85+ y: RR 1.16, 95% CI 1.08-1.24, P = 0.033), producing incidence rates for ED visits of 173/1,000 inhabitants aged 65-84 y and 387/1,000 inhabitants aged 85+ y. In 2010, the RR of attending ED was 2.24 (95% CI 2.13-2.36, P < 0.001) times higher for the 85+ y than for the 65-84 y age group (Figure 2). Evolution from 2005 to 2010 of the incidence rate a of Emergency Department visits by the permanent resident population of Lausanne b by age groups. Legend: a And its upper and lower 95% confidence intervals. b Includes districts of Lausanne and West Lausanne, Statistique Vaud 2012. Comparisons of ED visit characteristics in 65-84 y and 85+ y patients, as well as their trends between 2005 and 2010, are provided in Table 1. During this period, despite the sizable increase in absolute numbers of ED visits in both age groups, there were little or no changes in the distribution of selected variables. Most of the 65+ y patients admitted to ED were still living at home (88% for 65-84 y, 82% for 85+ y in 2010). In 2010, 14% of the 85+ y patients who visited the ED were nursing home residents. The most common reason for ED visit involved cardiovascular problems in the 65-84 y patients and trauma in the 85+ y patients. * P Value < 0.05.
bSingle, widowed, divorced, separated, unknown. cAcute care, psychiatric and rehabilitation hospital. eThe three most common reasons for ED visit according to age group and year. hSmall differences with median length of ED stay reported in the survival analyses are due to censored stays (in-ED death and ED stays over 48 hours). We also looked at disposition after ED stays. In 2005, 62% of ED visits by 65-84 y patients resulted in hospital admission (2010: 59%), mostly acute care, while 34% of patients returned home (2010: 38%). Despite this decrease in the rate of hospital admission between 2005 and 2010, the absolute number of hospitalizations for this age group increased by 607 patients. By comparison, among 85+ y patients, hospital admission was more frequent, approaching 70% in 2010, and home discharge from ED was less frequent (about 22% in both 2005 and 2010). From 2005 to 2010, an additional 681 ED visits resulted in a hospital admission in this age group. Overall, 3.5 additional patients aged 65 years or more were hospitalized each day in 2010 compared to 2005. Figures 3a and b show the probability of ED discharge (at home, nursing home or hospital admission) during the first 48 hours of stay. Patients aged 65-84 y had a shorter ED stay than their older counterparts in 2005 and 2010. Differences in median length of ED stay (50% of patients having already left the ED) between the two age groups averaged 2 hours 5 min in 2005, increasing to 2 hours 45 min in 2010. This increase resulted from inverse trends in length of ED stay in the two age groups, with a significant decrease among 65-84 y patients (from 6 hours 55 min to 6 hours 38 min, log-rank P = 0.003), and a significant increase among 85+ y patients (from 9 hours to 9 hours 23 min among 85+ y patients, log-rank P = 0.010). Sensitivity analysis without censuring death and stays over 48 hours provided similar results (results not shown). 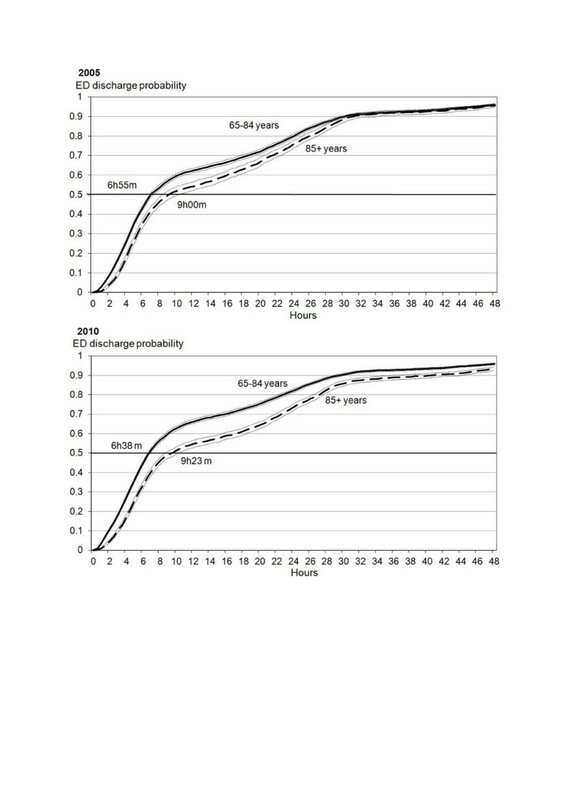 Probability of Emergency Department discharge a during the first 48 hours of patients aged 65–84 years vs. 85 years and over, 2005 and 2010. Legend: a Home, nursing home or hospital admission. Log-rank comparing patients aged 65–84 years with patients 85 years and older in 2005: P value < 0.001. Log-rank comparing patients aged 65–84 years with patients 85 years and older in 2010: P value < 0.001. Log-rank comparing 2005 to 2010 among patients aged 65–84 years: P value = 0.003. 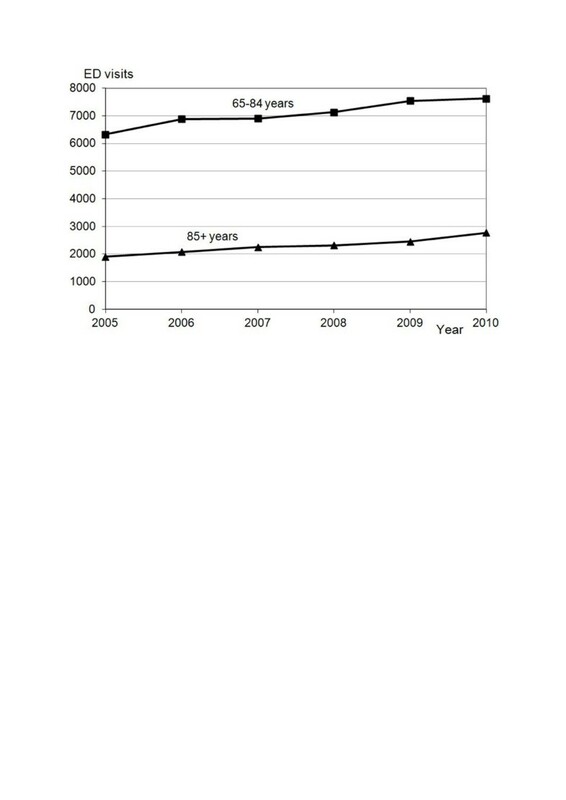 Log-rank comparing 2005 to 2010 among patients aged 85 years and over: P value = 0.010. This study provides original information on current ED use in the elderly population and highlights the growing importance of older patients in this health care setting. A unique contribution of the current study is the provision of specific information about ED use among the oldest-old segment of the elderly population aged over 85 years. The volume of ED visits attributed to this population group is substantial, both overall and among the 65+ age groups where it accounts for a quarter of ED visits. Given the sharp increase in this specific segment of the elderly population expected in the next 20 years, the current aging of the elderly ED population is likely to show further expansion. Besides the demographic expansion of the population aged 85+ y, this evolution also results from an increased incidence rate of ED use among this population over the timeframe covered by this study, a trend that was further confirmed in 2011 (data not shown). According to our estimated incidence rates for ED visits, inhabitants aged 85+ y were twice as likely to visit ED as inhabitants aged 65-84 y. This trend may reflect the chronological trend of disabled elderly persons to remain at home for longer rather than to be institutionalized. Alternatively, overuse for non-urgent conditions is sometimes mentioned to explain increased ED use in older persons [13, 14]. However, the results from this study do not support this hypothesis, as there was no indication of any increased inappropriate use for non-urgent conditions or high readmission rates in the study population. Rather, there was a high proportion of patients in triage levels 1 and 2, i.e. requiring care within 15 minutes, a finding likely explained by the selective reorientation of some patients from triage levels 4 and 5 to the outpatient consultation service when felt appropriate. Interestingly, incidence rates for ED use observed in this study were lower than those reported in previous studies (173 and 387/1,000 inhabitants aged 65-84 y and 85+ y, respectively, in this study vs. 450 and 820/1,000) [2, 15, 16]. The high density of primary care providers in Lausanne, with free access provided by the universal insurance coverage, as well as the good network of easily accessible home care services, may explain these lower figures observed in the current study. Nevertheless, these differences are unlikely to buffer the ongoing and future increase in the oldest-old ED population. Therefore, results from the current study further emphasize the need for ED staff to continuously adapt their process of care and acquire specific geriatric skills. The current study expands previous findings that showed higher resource utilization and poorer outcomes in patients aged 65+ y compared to younger patients [4, 6]. To our knowledge, this study is indeed the first to report the persistence of an age gradient in ED use among patients aged 65+ years. Moreover, this study extends our knowledge in highlighting diverging trends between youngest- and oldest-old patients over time in hospital admission and length of ED stay. Results show that, once presenting to the ED, oldest-olds patients were more likely to be admitted to the hospital than younger ones, a difference that increased over time from 2005 to 2010. Differences in hospital admission rates are essentially due to a decreased rate for patients aged 65-84 y, whereas this rate remained stable over time among those aged 85+ y. Likely, youngest patients may have benefited more from the shift from previously in-hospital activities and interventions to outpatient services. Further investigations are required to confirm this explanation. Of note, because of the overall aging of the population, despite the decreased admission rate observed in patients aged 65-84 y, the absolute number of admissions in this age group actually increased. Similarly, this study provides original information on the chronologic trends in ED length of stay. Previous studies described longer ED stays for patients 65+ y when compared to younger patients [6, 17–19]. The current study adds to these observations in showing that both age groups were significantly affected over time, but in opposite directions: while ED length of stay shortened in younger patients from 2005 to 2010, it lengthened in older ones. Hypotheses proposed to explain the differences observed between younger and overall 65+ ED users are likely to apply in the oldest-old age group. Firstly, medical evaluation of oldest-old patients is more complex and time-consuming [6, 17]. Secondly, the lack of available hospital beds downstream may prolong ED stay . In our study, the significant drop in length of ED stay observed in patients aged 65-84 y, combined with the decrease in their hospital admission rates after ED stay, may support this hypothesis. Thirdly, hospital beds are traditionally freed at the end of the afternoon, whereas about one half of older patients are admitted to ED between early morning and early afternoon . Finally, discharges of oldest-old patients to their home or other health institutions require thorough and time-consuming coordination to ensure adequate transitions. Nevertheless, attention should be paid to the evolving gap between both age groups with respect to length of ED stay over time. This trend may reflect an emerging mismatch between the services offered by ED units and the complex needs of geriatric patients [16, 22, 23]. Furthermore, ED structures may be deleterious for these patients when, for instance, limited access to natural light promotes delirium in cognitively impaired patients and a cluttered environment may represent a fall hazard . ED ward managers should bear in mind that the ongoing increase in ED geriatric patient numbers will lead to an aging of their patient mix. Multimorbidity, functional, sensory and cognitive impairments will become prevailing issues, resulting in more heterogeneous care needs. These changes will have serious consequences on the organization and working procedures of ED teams, requiring urgent modification of the training curricula and care delivery process [16, 25]. Only few studies have been conducted to optimize care provided in the ED to oldest-old patients. For instance, comprehensive geriatric assessment and management was shown in some studies to improve health outcome and decrease readmission in older ED patients discharged to their home [26–30]. Additional studies also investigated the benefits from best practices implementation within the ED to better meet the needs of the oldest-old patients with mixed results . However, these studies focused mainly on health outcomes and incidence of specific geriatric conditions such as delirium or falls, rather than ED length of stay. Our study presents several limitations. Firstly, this work was based on administrative databases that do not contain information on morbidity or investigations performed during the ED stay. Secondly, data are reported from a single institution and generalization is, as always, questionable. For instance, the higher proportion of high priority patients might result from local practice to re-orient some lowest priority patients to the outpatient clinic. However, trends observed in this study are much more likely to be related to demographic and epidemiological changes rather than the hospital’s practices and environment. Thirdly, as readmission rates were purposely calculated for each year separately, ED returns occurring in a different year than the year of first ED admission were missed, leading to a slight underestimation of the readmission rate. Our results highlight the growing importance of oldest-old patients in EDs. This trend results from the synergistic effects of an aging population and the increased incidence rates of ED use by the oldest-old population. Compared to their younger counterparts, e.g. patients aged 65-84 y, oldest-old patients show poorer outcomes in term of ED resource use, and the gap between both age groups seems to increase over time. The population aged 85+ y will be the fastest growing segment of the population over the coming years, with an absolute increase of about 50% by 2025. Even stable or slightly decreased ED visit incidence rates will not prevent the predicted acceleration of the aging case-mix in the ED population and the related changes in the care needs of ED patients. ED managers should be aware of these oncoming challenges so that they can adapt their training curricula and working procedures accordingly. The authors thank Professor Jean-Blaise Wasserfallen for his assistance and Sébastien Martenet for his help with data management. Sarah Vilpert received grant support from the Swiss School of Public Health. SV, CB, HJR and SMZ conceived and designed the study. LT provided the data. SV acquired and managed the data and performed the statistical analyses. All authors interpreted the data. SV and HJR drafted the manuscript. CB and SMZ participated in critical revision of the manuscript’s intellectual content. All authors read and approved the final manuscript.